This award is shared between the three players in the drama - Dr Wilyman, Professor Brian Martin who supervised the process, and the University of Wollongong which awarded the degree. Let's look at the three winners individually. Dr Judy Wilyman spent a decade working on this. I have read the thesis, well, most of it anyway (at 390 pages it is only slightly shorter than my paperback copy of Darwin's "The Origin Of Species"), but the standard of "research" can probably be summed up by the fact that the second sentence in the abstract repeats one of the standard diversions used by anti-vaccination campaigners worldwide: "Deaths and illnesses to infectious diseases were significantly reduced due to environmental and lifestyle reforms prior to the widespread use of most vaccines in the mid-20th century". Dr Wilyman is and always has been an opponent of vaccines, and the thesis is merely a regurgitation of the nonsense we have been hearing forever, including conspiracy theories such as that the Australian government vaccination policy is informed by a conspiracy between the WHO and Big Pharma. In other words, we knew what she was going to say before we had a chance to read it. 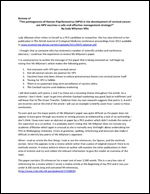 The "Publications in support of this thesis" include a link to a television show which quoted Ms Wilyman, with authorship attributed to Ms Wilyman (the actual author was journalist Anna Salleh), a paper in the journal Medical Veritas (a publication which is vehemently opposed to vaccination), a presentation at a conference run by an organisation which has run another conference specifically devoted to the dangers of radiation from mobile phones, and a couple of papers published in a journal produced by an Australian college of alternative medicine. (I couldn't find out too much about the college because their website was blocked by my antivirus program for trying to install malware on my computer.) Like I said, I didn't have to read far into the thesis before encountering red flags. Professor Brian Martin reacted to criticism of the thesis not by addressing the substance of the criticism but by accusing all critics of being bullies and crying "freedom of speech". These seem to be special interests of his lately, and a previous paper he wrote about people bullying the Australian Vaccination Network was submitted as evidence in at least two court hearings. (In both cases the magistrate ruled that it was inadmissible.) On the day that acceptance of the PhD thesis was announced he pre-emptively published a paper accusing anybody who might have something bad to say about the thesis of doing so with an ulterior motive. It is usually the job of the candidate to defend a doctoral thesis, not the supervising academic, and in any case any defence should be based on the quality of the work. By rebutting all criticism as simply being examples of bullying, Professor Martin is diverting the conversation away from where it should be going. As supervisor, he should have made a major contribution to the quality of the work but it seems that even he can't defend it. 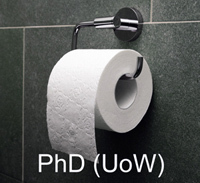 The University of Wollongong is included in the award because by allowing this thesis to be accepted it has tarnished the qualifications of everyone who has received a higher degree from the institution in the past and those who will do so in the future. The value of any qualification is inextricably linked to the standards set by and the reputation of the issuing institution, and the publicity surrounding this case could lead to employers reasonably questioning whether a degree from the University of Wollongong has any value at all. In giving a Highly Commended award to Judy Wilyman I'm deliberately ignoring the fact that she has a page on the site attacking me. While I appreciate the publicity I am not susceptible to bribes or flattery. 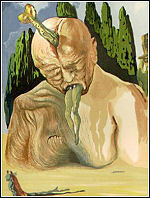 This site is here because it is often cited as an authority on the problems of vaccination, specifically the dangers of the vaccine against human papilloma virus, despite the fact that there is no material there by pathologists, immunologists, oncologists or anyone who might know anything about the connection between HPV and cervical cancer. The standard anti-vaccine arguments that have been spouting forth from the deniers almost since Ian Frazer announced the possibility of a vaccine are there - sexually transmitted so only sluts get it, multiple varieties of the virus and the vaccine doesn't protect against all of them, schoolgirls faint when a group are vaccinated together, never been tested (despite a clinical trial with 30,000 subjects, costing about $1 billion), no evidence of HPV-cancer link (shades of HIV-AIDS denial), and so on. The fact that Ms Wilyman is undertaking a PhD (in a sociology department) is continually used by anti-vaccination liars as evidence that she is an authority on vaccination and its dangers. The facts are that she has published nothing of any import in peer-reviewed journals and her PhD thesis could have been written before she started because she knew what she wanted to find. Judy Wilyman is a PhD candidate at the University of Wollongong. She uses this candidature at every possible opportunity to add credibility to her opposition to vaccination, and is often cited by anti-vaccination liars as an authority on the subject. Back in June I mentioned her vile conduct in suggesting that the parents of a child who had died of pertussis promoted vaccination for financial gain. Ms Wilyman has finally discovered what I had to say and has created a page on her web site about me. As there is no way to respond on her site to what she said, I will have to do it here. (You can see a copy of her original PDF page about me here.) My responses are in italics, and the usual yellow marker has been used to highlight inaccuracies. This continual conflation of me with Australian Skeptics is getting very old. I do not speak for Australian Skeptics unless I say so, and in almost any case where I do what I write will appear in an official Australian Skeptics publication. My blogs and websites are mine, not anybody else's, and they reflect my opinions, not anyone else's. I don't know how many times this has to be said but apparently it is a concept too difficult for the average anti-vaccination liar to comprehend. There is no debate while one side relies on lies and deliberate deception. 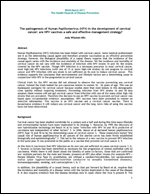 Put another way, on the one hand vaccination is safe and effective and there is no other hand. To say that the evidence for vaccines is anecdotal suggests that Ms Wilyman has done absolutely no research towards her PhD. There are literally tens of thousands of papers published in medical journals dealing with vaccine research and for a PhD student to suggest otherwise can only indicate either insanity or a refusal to look at anything which conflicts with a predetermined belief. He states 'I am not interested in vaccine safety' yet I have vaccinated 2 of my 3 children. Where is his evidence? Why didn't you vaccinate the third child? The evidence is on your web site, where there is nothing supporting vaccination at all but a lot of material suggesting that vaccines are dangerous. All of the links to external sources of information are to anti-vaccination sites except one, and even for that one you can't help lying. What else can you call it when you say "The ingredients of vaccines are not clearly listed on the Immunise Australia Program website so I have provided a link here" and then provide a link to where the ingredients of vaccines are clearly listed on that site. He ridicules my research that has been published in peer-reviewed journals and these are also available for people to see on my website. I don't ridicule any research, but as far as I can tell from your web site you have only published in suspect journals. Your paper most cited by anti-vaccinators was a conference presentation, and this was comprehensively refuted by Dr David Hawkes. Two papers in the Journal of Australasian College of Environmental and Nutritional Medicine hardly encourage credibility and as for Medical Veritas I would be more impressed with an article in Nexus Magazine. At least Nexus isn't exclusively an anti-vaccination publication and sometimes even includes articles which are interesting in their craziness. 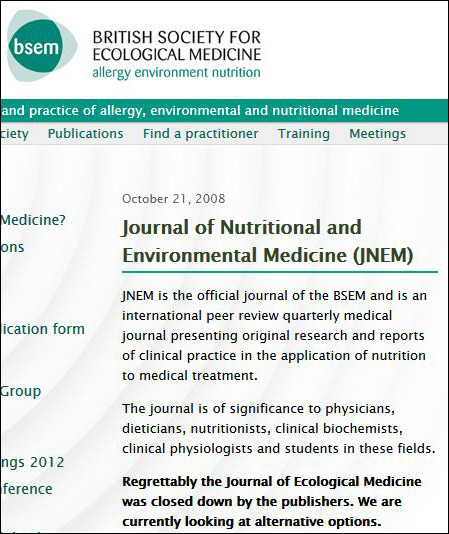 As for the Journal of Nutritional and Environmental Medicine, it looks like it hasn't existed since 2008. 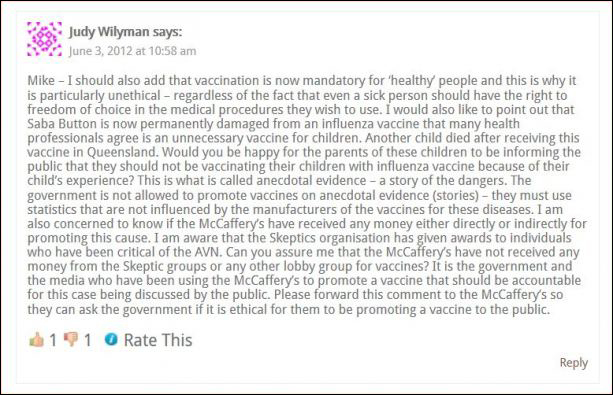 He stated that 'I have accused the parents of a child who died of whooping cough of being paid to support vaccination'. At no time have I suggested that the family was 'paid to support vaccination'. The statement I made asks if any lobby groups have provided financial rewards to acknowledge the family's involvement in promoting this vaccine. And yes - the lobby group that Peter Bowditch belongs to has provided an award to this family. I do not belong to any lobby group. Please get that through your head, Ms Wilyman. Australian Skeptics is not a lobby group. And yes, you did suggest that the family were paid. The family did not receive any money for "promoting this cause". The family did not receive any money "for vaccines". They were awarded a prize because they were the outstanding candidates during the year for a prize given for "The Promotion of Reason". I realise that reason dictates support for vaccination, but that is not why they were given the prize. In any case, they donated the money to medical research. The sort of research you could be doing if you were a real researcher, not someone going through the motions in order to reinforce an idiotic, unscientific prejudice. He states that 'I have been asked by the McCaffreys to leave them alone'. This is untrue. The family has never corresponded with me or made this request. So you require them to ask you personally? They have made it quite clear on many occasions that they want to be left alone. I don't mention either their names or the name of their daughter without asking their permission first, and the only time I have had to do that recently was to respond to lying attacks on them by people who say, for example, that they have been paid for their opinion. I once suggested that you should look up "STFU" in the dictionary. While you're there, look up "FOAD". The concerns that the public would like to debate are why vaccines are being promoted to the public on anecdotal evidence when this has never been allowed in government policies in the past. The Skeptics must ask themselves if they would like anti-vaccination campaigners to be promoting their arguments on the death or injury of a child to a vaccine. Clearly they would not and this is a debate the public would like to have without individuals being smeared on public websites and blogs. Vaccines are not promoted on anecdotal evidence, and to say so is not being misinformed, it is a lie. And what else do the anti-vaccinators do except promote their arguments on the basis of anecdotal and apocryphal deaths or injuries caused by vaccines? There is a reason I call anti-vaccination liars "liars". It is because they lie. Compulsively and continuously. An anti-vaccine campaigner doing her PhD at University of Wollongong has maintained her candidature despite implying the family of a child who died from whooping cough were liars. Judy Wilyman has also linked autism with vaccines and recently questioned the value of the vaccine Gardasil in the fight against cervical cancer. The arts student's thesis, which she has been working on for more than four years, is titled "A critical analysis of the Australian government's rationale for its vaccination policy". On her website, Vaccine Decisions, she updates "news" and shares her thoughts on the "plausible link" between autism and vaccines. She regards vaccine choice as a human rights issue. Ms Wilyman's "thesis" was the subject of an article in Australasian Science mamagzine.